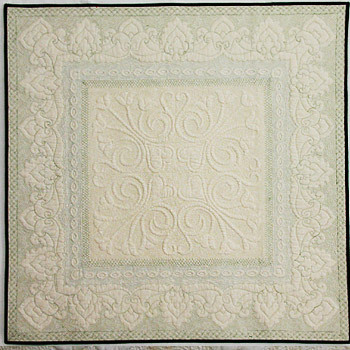 Ode to Trapunto an award winning quilt by Diane Loomis, a New England heirloom machine quilting artist . This wall hanging was started as a class project in Diane Gaudynski's 'Trapunto' class at Images 2004. The trapunto design in the center is from Hari Walner's book on machine trapunto. 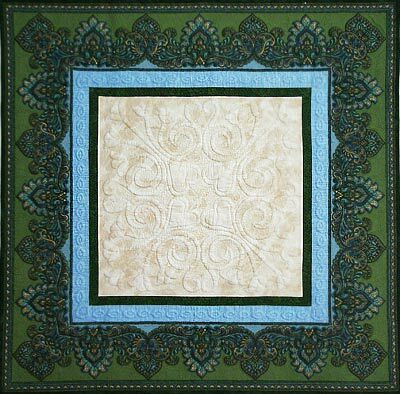 In addition to the trapunto in the center and small blue border, the Jinny Beyer printed border is trapuntoed as well. Its hard to see in the photograph, but it really makes the border stand out nicely. This quilt was machine quilted using YLI #100 silk thread, front and back, and was my first adventure in 'micro-stippling' (see detailed photos below). I loved Diane's classes and learned so much from her. 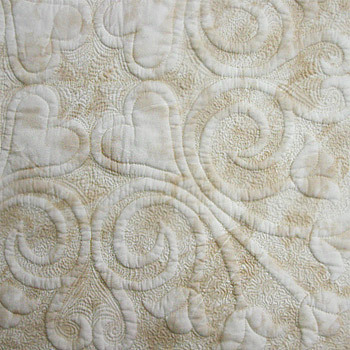 I liked working on this quilt so much that it was one of the few quilts I finished in 2004, and the first class project I ever finished immediately after the class!